Wall Street as usual enjoys denying facts until they become so obvious to the common person on the street. By then, it is too late to react. For example, sub-prime wasn’t a problem until it lit the fuse that set the global economy into a downward tailspin. Analysts at Barclays Capital are now coming out giving full attention to shadow inventory in the markets. 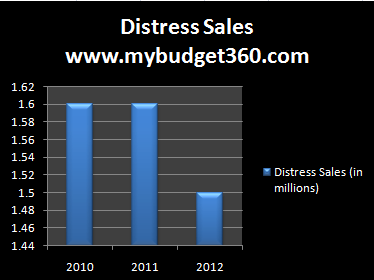 Even though their report states that the pipeline for shadow inventory may be topping out, we have such a large number of distress properties in the pipeline that we won’t see any draw down of distress sales until 2012. And ultimately the sales end is what keeps prices lower because distress properties sell for less. 2.4 million mortgages are 90+ days late. Another 2.1 million are in the actual foreclosure process. Yet banks only have 478,000 homes listed as REOs today. In other words, we have a giant pipeline of distress properties that will be hitting the market, trickle or no trickle, for the next few years. What this also tells us is that pressure on housing prices will be the status quo for years to come with an already pre-built supply of cheap properties. If you assume that we sell 4.5 to 5 million existing homes per year, this amounts to over 30 percent of all existing home sales for the next few years will be distress properties. This is already in the bag. So even though you might hear that the pipeline is getting smaller I wouldn’t exactly take this as a vote of confidence for the housing market. I mean how much worse can it get? There are such a large number of homes in distress that it is simply clogging the inventory pipelines for years to come. 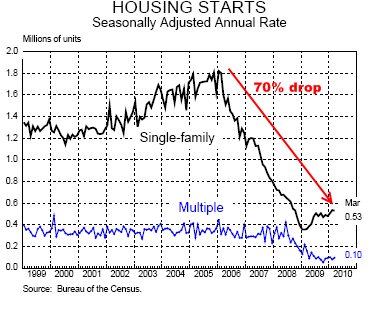 Even today, after a supposed recovery housing starts are down by a record breaking 70 percent from their recent peak. The last time we saw anything resembling this was back during the Great Depression when home building came to a screeching halt. But if you look above at the multi-unit starts this hasn’t even moved. Why? Commercial real estate is the next major problem area for the markets. With a saturated market, vacancies are still sky high so the need for more housing units is going to be muted for years to come. The problem with the shadow inventory pipeline is that it also guarantees that construction will not lead us out of this recession as it has in the past. Then again, never have we been so dependent on real estate and the financing from Wall Street to create a bubble of legendary proportions. This massive build up with inventory guarantees pressure for years to come and home prices will stagnant or drop short of middle class incomes going up. Short of that, prices will continue to drop to reflect the actual amount Americans can pay.